If, like millions of people around the world, you aim to eat and live healthily then fish is one of the best things you can eat. High in nutrients and low in fat it makes the perfect healthy treat. 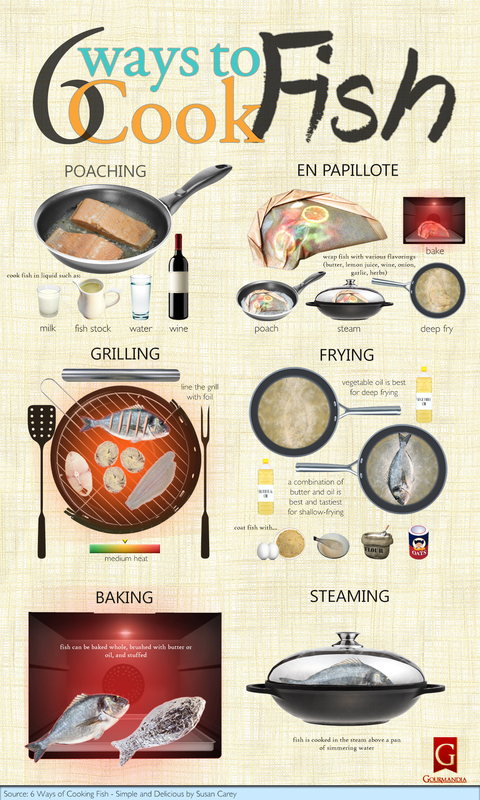 There are many ways to cook fish but we've chose six timeless techniques anyone can practice at home. We've also included a few recipes to help you master each way of cooking fish. Poaching yields a tender fish without any added fat. You can poach fish in basically any liquid but a combination of fish stock, wine and herbs is ideal. The poaching liquid should be at a gentle simmer before dropping in the fish. Recommended recipe: Japanese seafood stew. En papillote is a French term that refers to wrapping fish in parchment paper (or foil) before cooking. Fish may be packed with herbs, lemon wedges or some veggies before being wrapped and placed in a hot oven or over a grill. You'll want to ensure the edges of the paper are rolled tightly to hold in steam. Recommended recipe: fish en papillote with citrus and ginger. Grilling fish is a summer time favorite. For successful grilling you should generously oil the grill and use medium heat. Firm fish like tuna may be skewered for a fun alternative. Recommended recipe: grilled sardines with tomatoes and thyme. Albeit not the healthiest way to consume fish, frying is still a delicious option. For deep frying a simple breading is all you need or just dredge the fish in a bit of seasoned flour before dropping into the hot oil. Alternatively, you can shallow fry the fish in a pan using a small amount of oil and medium-high heat. Recommended recipe: Pan-fried sea bass in coconut curry. Unlike poaching, steaming fish doesn’t require complete submersion in water. If you don't have a bamboo steamer on hand try this way to cook fish: fill the bottom of a pan with water, put an inverted plate inside and place the fish on top once the water is simmering. Cover with a lid and steam until flaky. Recommended recipe: Cantonese-style steamed salmon with garlic. The options for baking fish are endless. Fish may be brushed with butter, covered with a mixture of crushed nuts and garlic, baked whole or stuffed. Or placed in a pan and covered with foil so it can steam in the oven. Recommended recipe: Bangara-style baked swordfish. This video from Chefsteps teaches you the ins and outs of vacuum compression.